Prime Minister Nguyen Tan Dung affirmed the Vietnamese Government’s support for cooperation projects between the two countries while receiving Minister of Trade and Foreign Investment Rodrigo Malmierca Diaz in Hanoi on September 4. 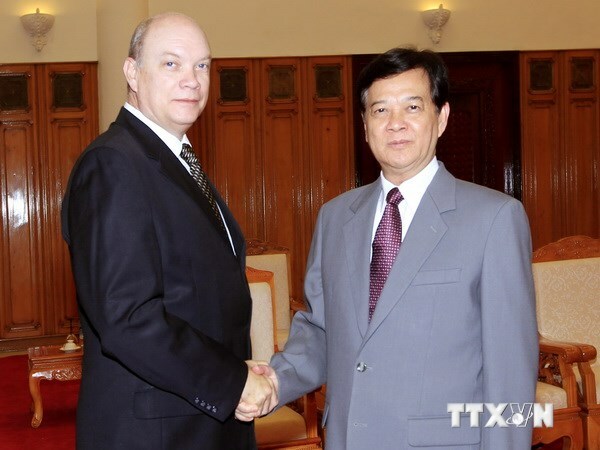 PM Nguyen Tan Dung (R) receives Minister of Trade and Foreign Investment Rodrigo Malmierca Diaz in Hanoi. Dung described the visit as a milestone in promoting multifaceted cooperation between Vietnam and Cuba as a result of an introduction of Cuba’s Investment Law and new policies for foreign investment attraction. “Vietnam attaches special importance to developing ties with Cuba and pledges its best efforts to further promote extensive and effective cooperation in economics, trade and investment. The signing of a medium-term cooperation programme will provide an important foundation for both sides to spur bilateral cooperation in the aforesaid fields.” Dung said. The Government leader also reiterated Vietnam’s willingness to support cooperation projects with Cuba on telecommunications, agriculture and food security by offering the best possible conditions for Vietnamese businesses to run investments effectively in Cuba. For his part, Minister Rodrigo Malmierca Diaz told his host that on the basis of the sound traditional friendly relations, Cuba wants to continue expanding cooperation with Vietnam in all fields and share experiences in agricultural development, telecommunications, foreign investment management and construction of industrial parks and export processing zones. Minister Rodrigo Malmierca Diaz asserted that his nation will build and fine-tune mechanisms and special preferential policies for Vietnamese investments in Cuba. He also urged the two sides to strengthen trade exchange thus facilitating businesses’ easier penetration into each other's market.